The Avery emanates a sleek contemporary style to create a modern master bedroom. Clean lines are highlighted in a bright white finish and accented by black color bases of each piece. 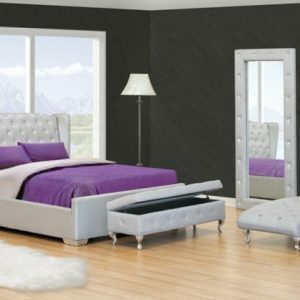 The bed features a low profile foot board and rails to showcase the high tufted head board to create a focal point in the room. Drawer faces are left bare and are paired with generous black feet to complete the modern design, adding this collection into your bedroom create an open and bright effect.